The PoE and PoE+Giga-MiniMc are low-cost, compact, multi-port media converters that support both PoE and PoE+ standards. Utilizing their flexibility and compact size, interior private network applications can further benefit from the ever-expanding versatility of the MiniMc product line. Featuring 2-10/100/1000Base-T copper UTP ports and one SFP uplink port that supports either a copper or fiber SFP, the PoE and PoE+ Giga-MiniMc are Power Source Equipment (PSE) devices. The PoE+ Giga-MiniMc is capable of powering up to two Powered Devices (PD) over standard CAT5 cable or better, whereas the PoE Giga-MiniMc can power one PD device via a copper port while delivering data over the other copper port. The PoE+ Giga-MiniMc is able to power high-power devices such as touch panels, PTZ (pan-tilt-zoom) IP surveillance cameras, and RFID readers that require more power than the typical 15.4 W provided by standard PSE devices such as the PoE Giga- MiniMc. PoE media converters and PoE+ Giga-MiniMc models are fully compatible with the IEEE 802.3af/at standards to ensure a seamless integration into your network. 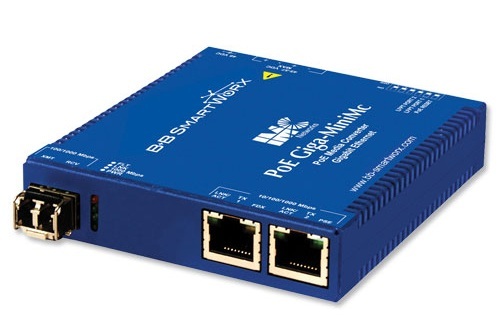 Enhanced features include store-and-forward, Autocross, an LFPT DIP Switch, and PoE reset on fiber loss of signal. PoE reset is an advanced function that, when enabled, will force the PSE output power to reset when LINK state is lost on the SFP port. – * Maximum input power in Watts is calculated by multiplying the input amps by the lowest input voltage.